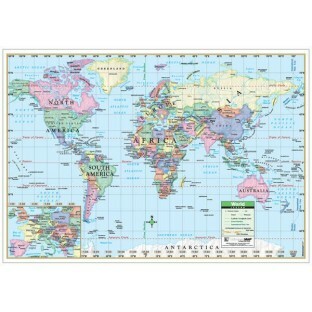 Includes oceans, seas, rivers, lakes, continents, countries, capitals and major cities, and more! Updated! Now includes South Sudan. The World paper Political/Physical Wall Map by Kappa Map Group measures 40"W x 28"H. Accurate, authoritative and up-to-date, the map includes an inset of Europe, Tropics, Equator and Prime Meridian lines. Includes oceans and seas, rivers and lakes, continents, countries, capitals and major cities, International Date Line and Time Zone, and the lines of Latitude and Longitude. Maps come rolled in a plastic sleeve.